Editor’s note: We recently received the following letter from the director of a music center in Malta. Since it pertains to such an important topic, we sought the help of violinist and collector Ralph Wolin to share general guidance on the subject. I just purchased 14 old violins and a cello and from a local person who is well known as someone who repairs violin had told me that I have purchased some good violins but I obviously do not know about them [be]cause I only specialize in percussion. Can you please guide me what I can do and were I can put them at least not to damage them before I trust them in someone’s hands so he can restore them for me although I am not trusting anyone to work on them yet. Care of fine string instruments can be surprisingly controversial. What at first seems to be a simple matter of maintenance becomes series of choices between ease of use today and conservatorship for the future. Setup and maintenance decisions can impact the near-term playability of instruments, as well as their long term preservation. A balance between playing and preserving is itself controversial. Many musicians regard the “stockpiling” of classic and pure examples of master makers, which some collectors undertake, as a blatant disregard of the instrument’s creation as a tool for the performance of music. On the other hand, curatorial-minded connoisseurs regard constant concert use of classic instruments to be an unforgivable loss to posterity. Their belief is that heavy use compromises the instruments. Thus, well preserved specimens of the master makers will become increasingly rare to future generations. Both camps have valid points. In dry climates and during the winter some people argue for the use of humidity enhancing devices such as Dampits. Others will use room humidifiers or devise more makeshift means to hydrate their instruments. Some musicians polish their instruments regularly to keep them shining brightly. Others rush to the nearest violin repair person for a soundpost adjustment every time the sound or feel of the instrument exhibits the slightest change. Some musicians fiddle with their bridges and strings almost constantly and some even endeavor to handle their own sound post adjustments. Others never touch their instruments at all, and pay little or no attention to the valuable tools on which they make their living. Extreme heat will cook the varnish on an instrument, and ruin the texture of that varnish, if not ruining the varnish altogether. Extreme cold may cause the varnish to blister and the plates to crack. Extreme humidity or extreme dryness will sometimes cause debilitating changes to the neck angle, as the upper block swells or shrinks. The most important thing for maintaining health and playability of fine string instruments is stability of heat and humidity. A slightly dry environment may be just fine for the instrument, as long as it is a stable one. For this reason I recommend against the use of Dampits or steam. During normal seasonal change, or when traveling from one climate to another, instruments often squawk at first, but normally they will settle down within a couple of days. Attempts to change the micro-environment will usually just delay that adjustment. When in doubt leave an instrument as it is. 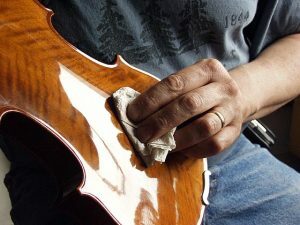 Just wipe off the excess rosin dust and any accumulated sweat and dirt with a soft cloth after playing. That should be enough to keep the instrument reasonably clean. Occasional cleaning by a professional repairer can keep a luster on the instrument. Avoid the rubbing and polishing that remove the original patina! Proper soundpost adjustment is critical. That said, it is easy to damage an instrument both in fitting and adjusting a soundpost. Soundpost fitting and adjustment should be left to skilled professionals. Musicians do not sub-contract their gigs to repair people, and they should not trust themselves to handle their soundpost adjustments. Instruments change with the weather. When such a change occurs, analyze what has changed about the sound and response of the instrument. It may be possible to deal with changes through soundpost adjustment, but just as frequently one must simply learn to adapt to the changes. Even when performed by a skilled professional repairer, every soundpost adjustment risks damage to the top of the instrument. So adjustments should be undertaken only where appropriate, not as a cure-all. The bridge, when viewed from the side, should form a right angle with the lower side of the top plate. Maintain the bridge in proper position to avoid warping. While checking the bridge, it is advisable to examine the instrument for signs of warping, cracking or other wear and tear. When such problems occur take them to a professional repair-person. For long-term storage of string instruments (6 months or longer), it is advisable to remove the setup. Be sure that nothing is loose in the case and that there are no sharp edges that the instrument can rub against, such as bow holders. Long term storage of instruments is safest when the instruments are neither too high, where warm air collects and rooms dry out, nor too low where moisture collects that could cause damage. Don’t panic if the seams of an instrument come unglued. The seams are designed to give way under tension. It is an easy repair, and it may save you from a more expensive, and time consuming repair to a crack in the wood. In an extreme case one may need to remove the setup of an instrument, pending repair, to prevent more extensive damage. An example of this would be an open and moving crack, alongside the heel of the neck, in the back. The neck joint of a string instrument is a highly stressed area. If you see such a crack, remove the setup lest the crack grow and the neck break out of the back. Such damage, if allowed to occur, would depreciate the value of an instrument, and be difficult and expensive to correct. In general, less is more; the less done to an instrument, the less that may need to be undone by future restorers. On the other hand, good preservation is important both to the economic and the historic value of an instrument. String instruments are remarkably durable. With attention and common sense, an owner of a fine instrument can hope to pass along their art object to future generations. With proper care even a lifetime of use will make only a modest impact. Avoid extremes of temperature, humidity; cool, dry, stable is best. Wipe off rosin, perspiration; leave polishing to the shop. Have soundpost adjusted professionally, properly, and only when necessary. Keep the bridge aligned and check for wear, damage.